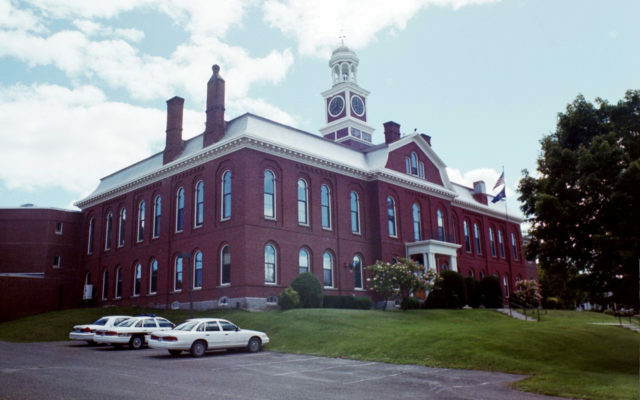 HOULTON, Maine — The following cases were heard under the Aroostook Criminal Docket at the Houlton Courthouse during the month of October. Lisa Starkweather, 56, Stafford Springs, Conn.: probation violation, 120 days in jail, probation revoked. Justin S. Moulton, 35, Houlton: probation violation, two years, three months in prison, probation revoked. Alen McLean, 32, Windham: operating after habitual offender revocation, priors, $1,000 fine, nine months and one day in prison. Ryan Caron, 29, Houlton: domestic violence assault, two counts, 180 days in jail all but seven days suspended, one year probation. Staci A. Hutchins, 32, Houlton: theft by unauthorized taking or transfer, priors, six months in jail, all suspended, one year probation. Makayla McGuire, 20, Houlton: unlawful possession of methamphetamine, dismissed. Aaron V. Putnam, 46, Houlton: criminal threatening, dismissed; disorderly conduct, offensive words, gestures, $100 fine, 24 hours in jail. Daniel C. Marley,33, Amity: domestic violence assault, 50 days in jail. Jess S. Glidden lll, 39, Amity: operating after habitual offender revocation, $500 fine, 30 days in jail. Deavin L. Davenport, 22, Littleton: operating while license suspended or revoked, $500 fine. Sandee L. Lowe, 33, Ludlow: OUI (drugs or combo), $500 fine, 150-day license suspension. Kyle Williams, 30, Houlton: theft by unauthorized taking or transfer, priors, 12 months in prison all but 30 days suspended, one year probation, $300 restitution. Andrew Adams, 27, Bangor: violating condition of release, dismissed. Trisha L. Carmichael, 43, Fort Fairfield: assault on an officer, dismissed; assault, $300 fine, seven days in jail. Jordan Pelkey, 26, Stacyville: unlawful possession of scheduled drug, $400 fine, five days in jail. Daniel Anderson, 35, Presque Isle: violating condition of release, $300 fine. Rene Dunlop, 36, Houlton: operating while license suspended or revoked, prior, $500 fine. Amanda Sue A. McAfee, 26, Houlton: OUI (alcohol), $500 fine, 48 hours in jail, 150-day license suspension. Troy C. Blier, 31, Caribou: failing to report, 15 days in jail. Jacob P. Carpenter, 32, New Limerick: domestic violence assault, dismissed; disorderly conduct, offensive words, gestures, $300 fine. Leonard J. Keyes lll, 29, Smyrna: assault, dismissed. Cleveland D. Long, 42, Portage Lake: criminal attempt, 30 days in jail. Ronald B. DuPont, 51, Linneus: operating while license suspended or revoked, $250 fine. Brandi Gene M. Hanning, 25, New Limerick: assault, $300 fine. Deavin L. Davenport, 22, Littleton: operating while license suspended or revoked, dismissed. Joyce M. Brewer, 53, Houlton: assault, $300 fine, 48 hours in jail. Annette Paul, 38, Houlton: domestic violence assault, 30 days in jail; criminal mischief, dismissed. William Campbell, 31, Crystal: operating vehicle without license, $100 fine. Nicholas Robert Royal, 40, Houlton: OUI (alcohol), $500 fine, 48 hours in jail, 150-day license suspension; operating while license suspended or revoked, $250 fine. Carol C. Cromwell, 44, Houlton: operating after habitual offender revocation, prior, dismissed. Samantha McCarthy, 24, Houlton: burning prohibited material, $100 fine. Stephen M. Desmond, 34, Presque Isle: trafficking in prison contraband, nine months and one day in jail; unlawfully furnishing scheduled drug, $400 fine, nine months and one day in prison. Megan L. McCallum, 37, Hermon: OUI (alcohol), $500 fine, 150-day license suspension. Makayla McGuire, 20, Houlton: violating condition of release, dismissed; operating ATV to endanger, 48 hours in jail; violating condition of release, dismissed. Aaron Astran, 26, Brewer: disorderly conduct, offensive words, gestures, $200 fine, 24 hours in jail; criminal trespass, 24 hours in jail. Cody James Boucher, 30, Mapleton: unlawful possession of scheduled drug, $400 fine, 30 days in jail; violating condition of release, 48 hours in jail; operating while license suspended or revoked, prior, $500 fine. Kimberly A. Jacob, 41, Woodland: failing to register vehicle, $100 fine. Paige EA Johnson, 22, Caribou: theft by unauthorized taking or transfer, $200 fine. Jonathan London, 52, Oakfield: violating condition of release, $100 fine; attaching false plates, $100 fine. Zvonko Radanovic, 62, Bridgewater: motor vehicle speeding: 30-plus mph over speed limit, filed on $750 costs. Devon Sheaves, 18, Houlton: operating while license suspended or revoked, $250 fine. Annie M. Hare, 26, Ludlow: theft by unauthorized use of property, dismissed; operating while license suspended or revoked, $250 fine. Judith Spooner, 55, Houlton: operating while license suspended or revoked, $250 fine. Tony A. Smith, 49, Houlton: operating vehicle without a license, $100 fine. Nathan P. Cyr, 24, Hersey: OUI (alcohol), $500 fine, 48 hours in jail, 150-day license suspension. Edwin A. Longley lll, 63, Crystal: misuse of E-9-1-1 system, $100 fine, 24 hours in jail. Katrina Webb, 41, Amity: operating while license suspended or revoked, prior, $500 fine. Danielle Anne McQuarrie, 37, Madawaska: trafficking in prison contraband, 40 months in prison. Anthony M. Thurlow, 33, Princeton: failing to report, 12 hours in jail. Annette Paul, 38, Houlton: violating condition of release, 48 days in jail. Katrina M. Leeman, 42, Houlton: operating after registration suspended, $100 fine. Thomas G. Jacques, 62, Danforth: operating vehicle without license, $150 fine. Kacey Fogarty, 25, Hodgdon: failure to register vehicle, filed on $100 costs. Casey Chase, 36, Dover-Foxcroft: attaching false plates, $150 fine. Devon Sheaves, 18, Houlton: motor vehicle speeding: 30-plus mph over speed limit, $300 fine. Daniel Marley, 33, Amity: violating condition of release, 14 days in jail. Gregory L. Huntley, 35, Sherman: violating condition of release, 10 days in jail. Gregory D. Malone Jr., 23, Houlton: violating condition of release, four days in jail. Ryan K. Blake, 43, Hodgdon: assault, $300 fine, seven days in jail; criminal threatening, seven days in jail. Steven J. Hovey, 37, Orient: failure to submit report (three counts), filed on $500 costs. David A. Carpenter, 55, Littleton: allowing dog to be at large, $50 fine. Christopher Connors, 48, Houlton: operating unregistered ATV, $200 fine. Karen Nickerson, 54, Houlton: allowing dog to be at large, $50 fine; keeping unlicensed dog, $50 fine. Anthony D. Constant, 27, Cupertino, Calif.: operating unregistered ATV, $200 fine. Skylar Hargrove, 27, Houlton: 15-minute parking areas 8 a.m.-6 p.m., $40 fine; no all night parkin (five counts), $40 fine (each). Mason Deabay, 19, Ashland: marijuana: under 21 years of age, $350 fine. Keacha Anne Corey, 39, Caribou: allowing minor to operate personal watercraft in violation, $100 fine. Marcel LaGace, 49, Hanwell: allowing minor to operate personal watercraft in violation, $100 fine. Stephen Guiggey, 60, Sherman Mills: operating unregistered ATV, $200 fine. Thomas G. Cyr, 61, Oakfield: operating unregistered ATV, $200 fine.